click, 1credit: Install a card from HQ in a remote server, then place 1 advancement token on it. You cannot score or rez that card until your next turn begins. After installing a card with Saraswati Mnemonics, when is the earliest that the Corp can rez or score that card? The restriction from Saraswati expires at step 1.4 of the Corp's turn. 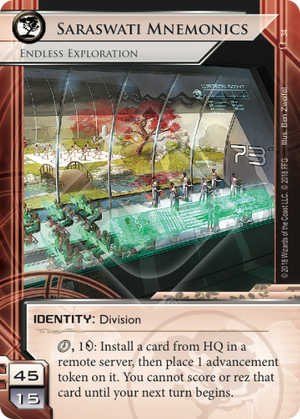 The Corp's first opportunity to rez or score the card after that point is step 2.1 before taking actions.